Bushmaster Firearms unveiled its impressive new website this week. The upgraded Bushmaster.com site now makes it easier to select guns and accessories for particular applications including competition, hunting/varminting, and self-defense. Bushmaster is clearly intent on becoming more than a “black rifle company”. A quick look at the website reveals that Bushmaster wants to promote the use of AR15-style rifles for hunting and target shooting. 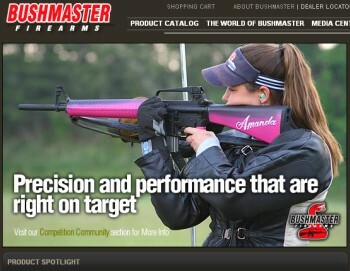 It speaks volumes that Bushmaster includes a picture of a female Service Rifle competitor on its new home page. The upgraded site has many cool features, including an advanced, interactive Flash diagram that allows users to view all the internals of an AR15 as it cycles. You can choose from different views, including transparent and cutaway. Definitely check this out. Tip: To see all the internal workings, including shell loading/ejection, hammer function, and buffer operation, click “Zoom In” twice, center the lower receiver using your mouse, and select “Split” from the menu bar. Bushmaster’s revamped website features a modern, secure e-commerce shopping cart system, with detailed specs and high-quality photos for all models including the new Real-Tree Camo Varminter (below). The Bushmaster site is now structured to serve six “Communities”, each representing a particular sector of the shooting market: Hunting, Competition, Law Enforcement, Military, Recreation, and Home Defense. Bushmaster Firearms International, LLC (BFI) is the leading supplier of AR15-type rifles in the United States for Law Enforcement, Security applications, and consumer applications. Headquartered in Windham, Maine with manufacturing facilities in Windham and Lake Havasu, AZ, BFI supplies both Aluminum and Carbon Fiber-based AR15 type rifles and accessories to its US customer base, as well as LEO and Military customers worldwide. BFI, along with Remington Arms, is owned by Cerberus, a large holding company. Share the post "New Bushmaster Website with Advanced Features"
Why don’t you make a version of your ACR rifle chambered in 6.5 Grendel with a 20″ barrel.